These traditional Jewish potato-onion fritters, often served on Hanukkah, have tender centers and lacy rims. Top them with sour cream or applesauce. Preheat oven to 200 degrees F. Place a wire cooling rack on a baking sheet; set aside. Peel and coarsely shred the potatoes. Rinse shredded potatoes in a colander. Place potatoes in a clean kitchen towel or three layers of 100% cotton cheesecloth. Twist the cloth to squeeze out the moisture. Transfer potatoes to a large bowl. Add onion, flour, parsley, salt, pepper, and baking soda to potatoes and toss to coat. Add eggs and stir until combined. In a large cast-iron or other heavy skillet, heat 1/4 inch of oil until hot. Drop heaping tablespoons of mixture into oil and press lightly with a fork to flatten slightly. (Be careful not to crowd the pan.) Cook for 3 to 4 minutes per side until golden brown, adjusting heat as necessary. Drain on paper towels. 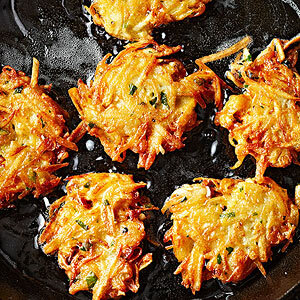 Transfer to prepared baking sheet and keep latkes warm in oven while frying remaining latkes. Serve warm with sour cream and/or applesauce, if you like.